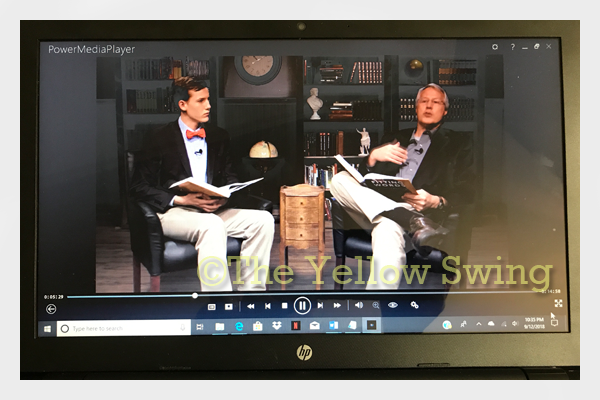 We had the opportunity to review a physical copy of the Fitting Words Classical Rhetoric (complete program) (FW), which is produced by Roman Roads Media. Roman Roads Media specializes in video courses. One of its first products we used was Economics for Everybody. I was initially impressed by the high-quality videos the company produces. We really enjoyed Economics for Everybody and that curriculum will be making a return in our school in the next couple of years for my other children. 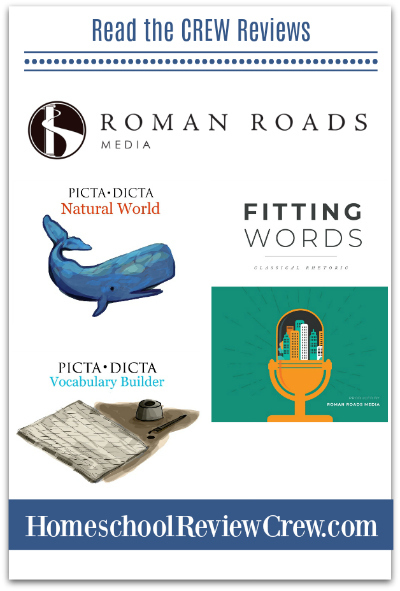 When I saw that Roman Roads Media was a company on our review schedule, I did not initially know what product(s) would be available for review, but knew I wanted to be on the review team. 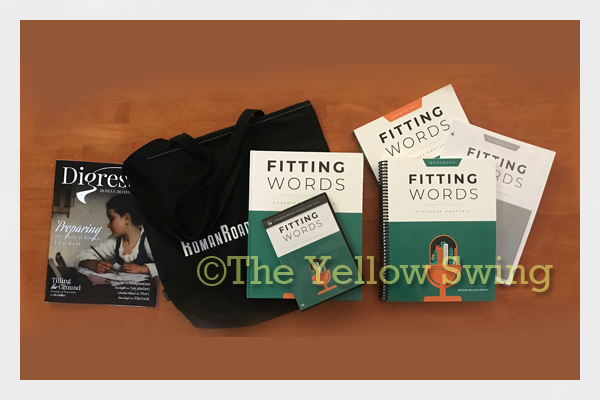 Fitting Words is a fitting curriculum for this season in our homeschool. I have high school children now. The Classical Rhetoric curriculum is geared towards students in tenth grade through adult. By the time your student completes this program, they will have the tools they need to communicate in an elegant and persuasive manner. 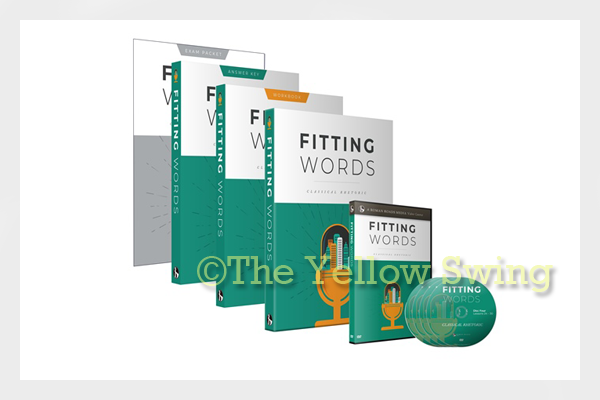 The Fitting Words Textbook and Student Workbook are the two main books for the course. I am totally impressed with both books. We received the second edition of the study, which has a minor change in its design; and I love the design. A great fact is that both editions are compatible, so you can mix the first and second editions. Homeschoolers are going to love that consideration. 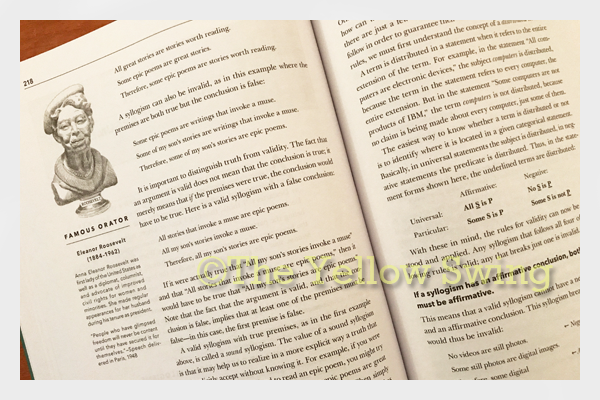 The textbook is a glossed, hardback book with matte pages that are great for highlighting and taking notes. I do not promote writing in our textbooks, but could easily do it, because of the finish. The workbook also has a glossed cover, matte pages, is consumable and spiral-bound, which I absolutely love. Having a spiral-bound workbook made it easy to work through the lessons. Lily did not have hold open the workbook as she wrote. I also have a left-handed child and spiral-bound always works best for him. The Fitting Words Answer Key is a soft-covered book with matte pages. It has all of the answers to the exercises and exams. The Fitting Words Exam Pack includes all nine exams and comes already three-hole punched. 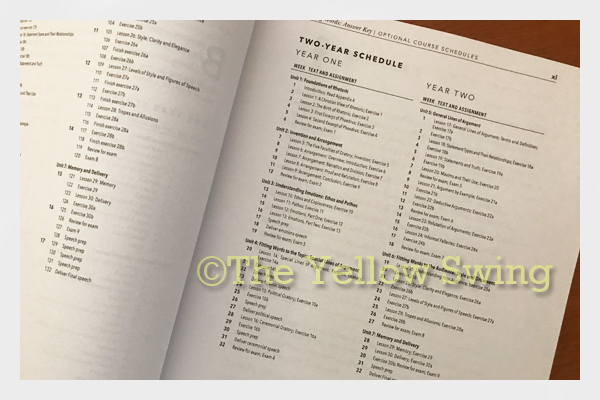 I really like that the exams come separately and are not included in the pages of the textbook or workbook. Little things like being able to mix material editions, exam packs and spiral-bound workbooks really make a difference to a homeschooler. Not only did I receive everything listed for the complete set, Roman Roads Media sent me a sturdy black Roman Roads Media tote bag to keep up with everything that comes in the bundle. Presentation is everything, but the curriculum is not just about looks. Before Lily started using the curriculum, I read through the forward, preface and introduction. It is suggested students read the latter two before watching the video, which she did. 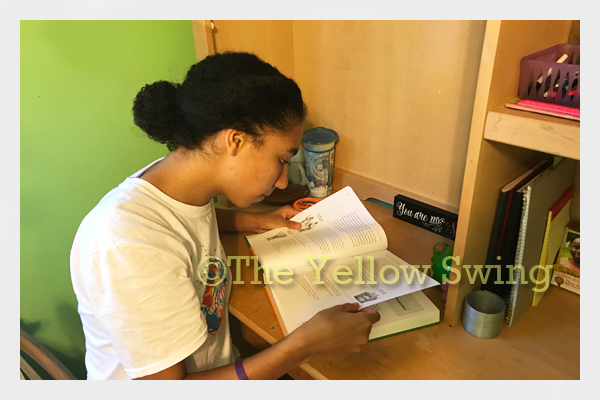 After she began the course, Lily watched the video first and followed through with reading the textbook. The video lessons and the textbook chapters are short, but thorough. There is no speed reading or rushing through the content, because there is a lot to learn. After reading only through chapter three, we both already learned so much. The focus of the material is on invention, arrangement, style, memory and delivery, which are the five faculties of rhetoric. The concepts students learn in the lessons are honed through the corresponding exercises they complete. Bible verses are included in each lesson and exercises as examples and reinforcements for the concepts that are presented. I love the connection students can see between rhetoric and the Bible (both are composed of fitting words). Each chapter also includes the sections Thinking Deeper – discussion questions; Developing Memory -memory and presentation practice and Reading Further – additional reading that will enhance what the student is learning. Other tools for learning are the nine exams students will take and the five speeches they will write over the course of the study. The video course even includes pre-tests videos for the student to watch. Nance tells the student exactly what he needs to know to pass the test. All of the video segments are not just lecture. On an occasion, it turns to a discussion format. This is a screenshot of lesson four, which includes dialogue between Phaedrus and Socrates, so a student participated in the video segment. 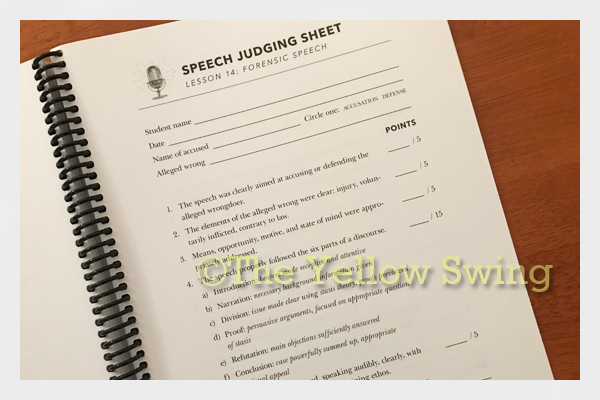 When a student presents their speech, they will be judged according to the criteria on the judging sheet. Another great resource are the appendixes, which include several famous speeches as well as a list of every speech that appears in the Bible. I did not know there were so many. • Are current and not dated (outdated) in presentation. • Take care of the instruction for the parent and allows them to sit and listen (and/or learn . . . or step away from teaching). • Speak directly to the student. • Are detailed in content and thorough in explanation. • Lectures are engaging and not boring. Although boring is relative, I think the videos are not boring. I looked forward to watching them. One of the beauties of homeschooling is the opportunity for me to learn areas of study that I did not get to do in high school. I never studied rhetoric, so much of what we are covering is new to me and I can already see a change in some of my writing. The pace of Fitting Words is for students to complete the study in one year. We already have several subjects scheduled for this school year and have some time, so I decided we will complete the course over two school years. Either way (one year or two), your high school student can earn 1 English (for Rhetoric) credit for high school. I already had another curriculum planned for River to use, but will be purchasing a second workbook, so he and Lily can work through Fitting Words together. I really love Fitting Words. I really love Roman Roads Media (quality)! 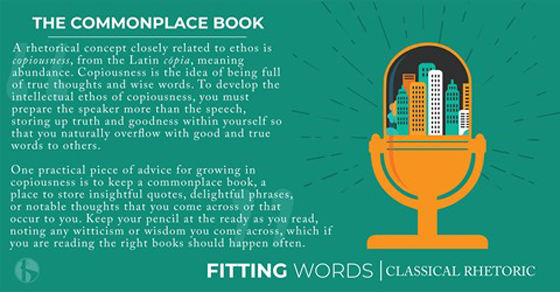 Fitting Words Classical Rhetoric (Bundle/complete program) is available for $204. You will want to purchase everything that comes in the bundle.